Watch this video to hear author and designer William McDonough speak on the wisdom of designing from Cradle to Cradle at a TED Conference. Green-minded architect and designer McDonough asks what our buildings and products would look like if designers took into account "all children, all species, for all time." William McDonough is an architect and the founding principal of William McDonough + Partners, Architecture and Community Design, based in Charlottesville, Virginia. From 1994 to 1999 he served as dean of the school of architecture at the University of Virginia. In 1999 Time magazine recognized him as a "Hero for the Planet," stating that "his utopianism is grounded in a unified philosophy that—in demonstrable and practical ways—is changing the design of the world." In 1996, he received the Presidential Award for Sustainable Development, the highest environmental honor given by United States. 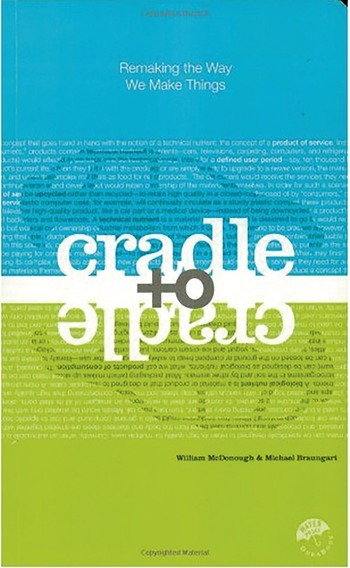 In 1995 the authors created McDonough Braungart Design Chemistry, a product and systems development firm assisting client companies in implementing their unique sustaining design protocol. Their clients include Ford Motor Company, Nike, Herman Miller, BASF, DesignTex, Pendleton, Volvo, and the city of Chicago.